Web Desk: Hydration of a body is necessary and none of the cosmetic product can replace its importance. Water is mainly used for hydration, but for a soft and moisturized skin you need to take some fruits. Here are 6 fruits you can take to stay hydrated. Lemons are rich in Calcium, Vitamin C, and magnesium. They can improve your immune system, also clean digestive and circulatory systems. Lemons help to fortify and invigorate your skin and also fight against free radicals that speed up skin aging. Apples are rich in Malic acid and tartaric acid. They contain 80% water which hydrate your body and helps to get rid of dead skin. Cucumber contains 97% water and also rich in Vitamin E. It hydrates your body naturally, makes your skin look beautiful and also improves the strength of your skin, hair and nails. They are the source of vitamins and minerals. It provides Vitamin A which keeps the mucous membranes of your skin healthy. It is perfect for the hydration of your skin. It also removes impurities from the skin. Due to rich in water content, it detoxes your body and resolves digestive issues. 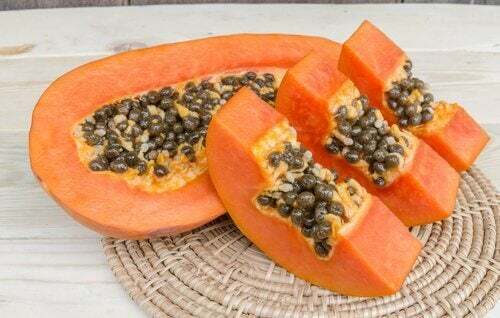 It is rich in Vitamin C, vitamin A, potassium and magnesium. It hydrates as well as nourishes your body. 2cups of watermelon can tackle 40% of the skin damage caused by the dehydration and environment.